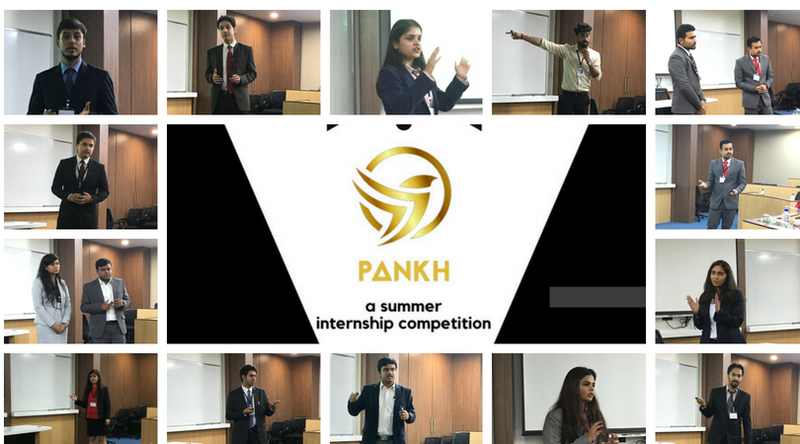 HRuday – the HR cell of NMIMS organised Pankh, a summer internship presentation competition on the 28th of July, 2018. The event witnessed participation from 2nd-year students of premier B-Schools such as TISS, IIM Rohtak, SITM, SIIB, IMT Ghaziabad, Welingkar and NMIMS. The participants were judged on 4 parameters – clarity, relevance, communication and experience & learnings from the project, by an esteemed panel of stalwarts from various industries such as Construction, Infotech, Banking. This year we had Satish Kumar, Head HR at L&T Hydrocarbon Engineering; Poonam Chandok, Head HR of L&T Transportation and Infrastructure IC; Ravi Vukkadala, CEO of Northern Arc Investment Managers and Mr. Anurag Thakurta, the Sales and Strategy head of Accenture Strategy. After a rigorous assessment of 250+ applications, only 14 teams made it to the final round where they could present their projects in front of the judges. Each team was given a total of 10 minutes to complete their presentation followed by a 2 minute Q&A session between the judges and the participants. The event served as a haven of knowledge for first-year students looking to get a hands-on insight into the vast variety of domains that the summer internships can entail. From projects on finance dealing with dealership business and risks in POD to projects on digital transformation and data migration. Some of the internship projects were HR based involving practices like hiring through referrals and employer branding wherein company specific tools were used to enhance the hiring and branding process. Manish Pinisetti from Tata Institute of Social Sciences emerged as the winner of Pankh ‘18. He spoke about his experience on gainful employment in the rural regions of Andhra Pradesh. Radhika Kotian from NMIMS won the Outstanding Performance – HR for her project on Performance Excellence Framework, Shekhar Jha from NMIMS won the Outstanding Performance – Marketing and Vipul Rao from Welingkar won the Outstanding Performance – Finance on Dealership business, Pulkit Benada from NITIE won the Outstanding Performance – General Management. The participants were provided with a short break taken care of by our food partners – Juno’s Pizza. Everyone present at the event was served with lip smacking pizzas. The winners also received food vouchers worth ₹1000. The fact that we were left with raving reviews from all the attendees and the judges further enforced that Pankh ‘18 was a grand success. We hope to maintain the streak for the years to come. Shalini and Rishabh are currently 1st year MBA students at SBM, NMIMS, Mumbai. Juggling between the scores of assignments and surprise quizzes, they found their solace in writing.